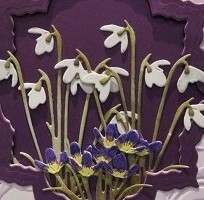 Welcome to Lisa.B.Designs : A Spring Floral Card : When is a Snowdrop not a Snowdrop? A Spring Floral Card : When is a Snowdrop not a Snowdrop? Good morning all! Martina here, using one of my favourite little Craft Emotions dies to add delicate bunches of flowers to a card. Guess what? It's my birthday today! I had to think how old I was going to be...it took a while, I have to admit! My first step was to make a background panel with an aperture. I used a die from my stash to cut an aperture slightly to one side, allowing for positioning and adding a sentiment later. Keeping with the purple tones, I die cut a frame to fit my aperture using the same size die as before. Taking the next size nesting die down, I cut into the shape again to make the frame. To make the snowdrops is so easy: I die cut all the elements from Super Smooth Card and then ran them through again to get the embossing detail. There was no need to do anything more with the petals, so I just used some Bundled Sage Distress Ink on the leaves, adding some Peeled Paint Ink to the raised sections. To make the crocuses, I cut down the leaves to make them shorter and turned the snowdrop petals upside down. Using pens, I coloured the centres yellow and the tops purple, striping down into the middle. To balance the card, I used some little wooden hearts from the Craft Emotions Owls and Branches Wooden Embellishment Set. I coloured the wood using Distress Ink and then added some Blackcurrant Sparkle Medium over the top - LUSH! I hope you like it: see how many little 'smiles' you can find when you're out and about!